KNOWN AS THE Silver State, the Battle-Born State, or the Sagebrush State, the mountain state of Nevada was admitted to the Union in 1864 as the 36th state. Covering an area of 110,540 square mi (286,297 square km), Nevada is 485 mi (780 km) north to south and 315 mi (507 km) east to west, making it seventh in size among the 50 states. Nevada has significant areas of land that remain uninhabited and under federal control. Nevada, which means “snow-capped,” ranks 35th in population The state is bordered on the north by OREGON and IDAHO, on the east by UTAH and ARIZONA, on the southeast by Arizona, and on the southwest and west by CALIFORNIA. Carson City is the capital of Nevada. The largest cities include Las Vegas, Henderson, Reno, North Las Vegas, Sparks, Carson City, Elko, Boulder City, Mesquite, and Fernley. Nevada’s arid/semiarid climate results in many days of sunshine broken by minimal precipitation, making it the driest state in the Union. Summers are long and hot, and winters are short and mild. Average temperatures range from a high of 70 degrees F (21 degrees C) in southern Nevada to 45 degrees F (7.2 degrees C) in the northern part of the state. The state’s highest temperature of 125 degrees F (51.6 degrees C) was recorded in 1994 at Laughlin. Annual rainfall is a scant 4 in (10 cm) in drier areas, while other parts of the state may experience up to 40 in (101 cm) each year. Snow may fall at any time of the year in northern Nevada. Covered with more than 300 mountain ranges and a section of the Mohave Desert, Nevada’s terrain is varied. 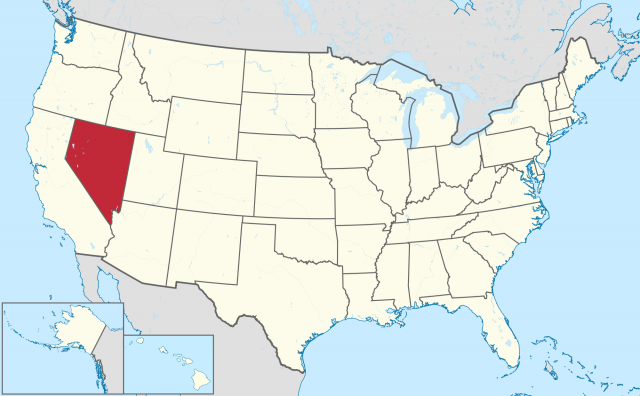 Most of the state lies within the Great Basin, which also includes parts of Utah, California, Oregon, Idaho, and Wyoming. Geographically, Nevada is divided into the Columbia Plateau, the Sierra Nevada, and the Basin and Range Region. The Columbia Plateau is located in the northeastern section of Nevada, which is underlain with lava bedrock. Over time, water has shaped this bedrock into the colorful canyons and ridges for which the state is known. As Nevada nears Idaho, the land becomes open prairie. To the south of Carson City, the Sierra Nevada Region is made up of rugged mountain ranges. Glacierformed Lake Tahoe is located in one of the valleys of this region. The rest of Nevada falls within the Basin and Range Region, which contains over 150 mountains. Toiyabe and Toquima mountain ranges are located in the central section, while the Snake and Toano are found in the east. Nevada’s other mountains include Boundary Peak, Wheeler Peak, Mount Charleston, and North Schell Peak. Single hills known as buttes and flat-topped mountains called mesas, along with geysers and hot springs, dot the landscape. Soil tends to be thin and alkaline. The highest point in the state is 13,140 ft (4,005 m) above sea level at Boundary Peak. The lowest elevation of 479 ft (146 m) above sea level is located at the southern part of the state at the Colorado River. Nevada’s principal rivers are the Humboldt, the Truckee, the Carson, the Walker, and the Colorado. Natural lakes are Lake Tahoe, Pyramid Lake, Walker Lake, Topaz Lake, and Ruby Lake. Nevada also has a number of man-made lakes, including Lake Mead, Lake Mohave, Lake Lahontan, and Rye Patch Reservoir. A land of abundant natural resources, Nevada produces gold, silver, copper, zinc, brucite, magnesium, magnesite, manganese, tungsten, uranium, mercury, lead, titanium, oil, coal, iron, opal, barite, molybdenum, diatomite, talc, gypsum, dalomite, lime turquoise, fluorspar, antimony, perlite, pumice, salt, and sulfur. The state’s major agricultural products include cattle, horses, sheep, hogs, poultry, hay, wheat, corn, potatoes, rye, oats, alfalfa, barley, vegetables, dairy products, and various fruits. Pinon pine, juniper, and fir are the major revenue makers for Nevada’s timber industry. The state’s chief manufactured products are food products, gaming equipment, monitoring devices, chemicals, aerospace products, lawn and garden irrigation equipment, and seismic and manufacturing equipment. Nevada’s wildlife includes mule deer, pronghorn antelope, bobcat, leghorn sheep, coyote fox, badger, rabbit, porcupine, muskrat, marmot, wild horses, and donkey. Lizards, tortoises, and snakes abound in the desert. Nevada’s birds include thrush, horned lark, Nevada creeper, pheasant, partridge, and sage grouse. Once known as the divorce capital of the UNITED STATES, Nevada has become synonymous with gambling and entertainment. Millions of tourists flock to Reno and Las Vegas each year, and Lake Tahoe, on the border with California, has become one of Nevada’s biggest tourist attractions.